Last month, I got a crazy idea. It all started on the fourth of July. Two of my friends had a bunch of people over for a barbecue. There were burgers and brats from the grill, salads, fruit, and homemade meringues. A couple of episodes of My Little Pony: Friendship is Magic were brought up so I watched my first-ever full episode of that followed by my second-ever episode. We had then settled into being inside people and wanted something else to watch. The most thematically-appropriate thing we could think of to watch was Captain America: The First Avenger because we are a bunch of nerds and it seemed patriotic enough. We all ended up leaving before the movie was actually over so I decided to finish it later that week. It was then that a brilliant questionable idea came to me. I needed to rewatch the MCU, including the TV series. I had always meant to go back to the beginning of Agents of S. H. I. E. L. D. to see how the big shake-up would color my viewing of the first 16 episodes of season 1 and it had been awhile since I had seen any of the phase 1 or 2 movies. Since I was already watching the first Captain America movie, mostly set during World War II, it made sense to watch everything roughly in the order the events occurred. Like any self-respecting nerd taking on a watchalong involving multiple properties with overlapping time lines, I made a spreadsheet. Feel free to use if you also feel like you need to watch 5 days, 1 hour, 48 minutes, and 50 seconds of movies, one-shots, and TV shows you’ve already seen before but don’t want to spend several hours of untangling what should go where. Especially those blasted Netflix shows. This watchalong won’t be as regimented as the previous Veronica Mars or The Wire watchalongs. I’m just going to watch a bit here or there as time and willingness allow. I sped through Captain America, both seasons of Agent Carter (RIP), and Iron Man but then I hit the wall of Iron Man 2, The Incredible Hulk, and Thor and the watchalong got set aside this weekend until a lack of plans and plenty of rain conspired to convince me to return. Iron Man 2 really is as terrible as I remembered it but at least it introduced Natasha and gave us these treasures. The Incredible Hulk isn’t necessarily bad so much as it is boring. So very boring. It’s pretty well-known that Edward Norton insists on having the ability to re-write the screenplay in pretty much every contract he ever signs and he often makes liberal use of this ability. I don’t know if that’s what happened here but if he did go after it, he certainly didn’t make it into a good movie. In comparison to these two movies, Thor seemed like a masterpiece. Certainly much better than I remember despite the lack of actual chemistry between Chris Hemsworth and Natalie Portman. Kenneth Branagh wasn’t a terrible choice to direct a movie filled with heightened, old-fashioned language and it was good enough to get everyone excited that Loki would be the villain for The Avengers. It’s also where I truly fell in love with Phil Coulson, a character that still feels like the heart of the MCU, even if the movies never actually acknowledged that he’s alive again. All of this lead-up was really to get to the movie that brought me to the MCU in the first place. I was never much of a comics fan, finding the decades of history impenetrable. Joss Whedon was the draw for me so I quickly sped through Iron Man, The Incredible Hulk, Iron Man 2, Thor, and Captain America: The First Avenger the first time I saw them so I could see The Avengers in the theater. I was already all in after Iron Man but The Avengers sealed my dedication to the MCU from then on. It doesn’t hurt that it brought us the best gif of all time. Now I just have two movies, two one-shots, and sixteen episodes of television before I get to the H. Y. D. R. A. shake up, possibly my favorite thing to happen to the MCU ever, and I love a lot of the MCU. 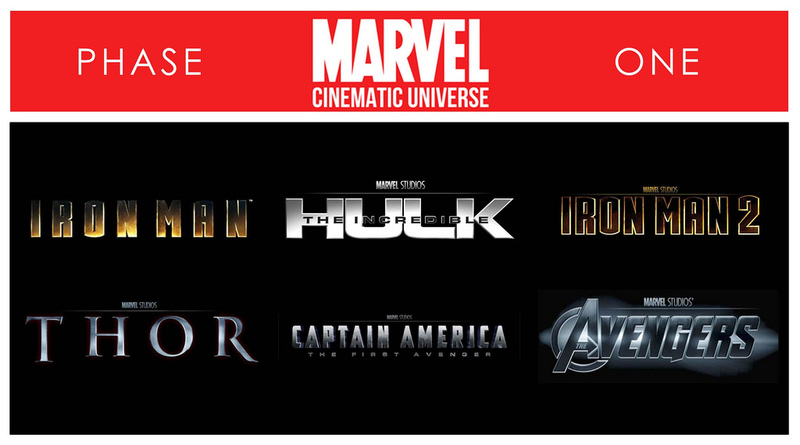 I’ll definitely watch Iron Man 3, the two remaining one-shots, and the start of Agents of S. H. I. E. L. D. this weekend but Phase 2 is where MCU really started to put out the movies and TV shows at a breakneck pace so this might be where the watchalong starts to feel like a slog again.